At the Conservative Political Action Committee (commonly known as CPAC) meeting over the first weekend in March 2019, President Trump said he would sign an executive order that would take away federal funding for any college or university that didn’t uphold the First Amendment. During his announcement Trump brought to the stage a volunteer from Turning Point USA who was physically assaulted while tabling for the organization on the campus of UC Berkeley in February. A person was recently arrested for that crime. 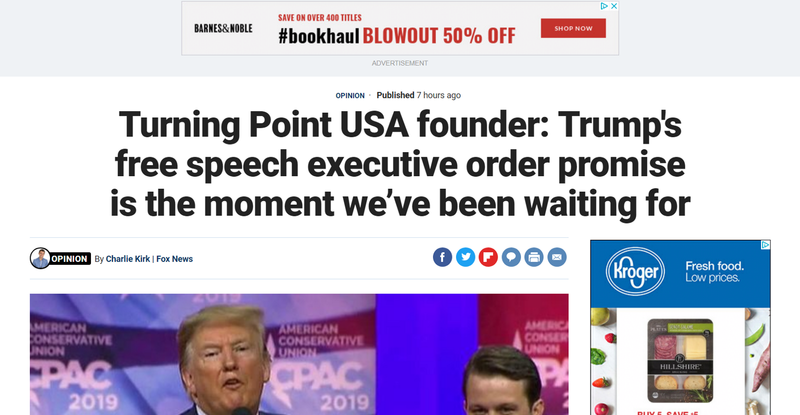 Charlie Kirk, president and founder of Turning Point USA, wrote an op-ed for Fox News on Monday March 4 about that executive order. I want to fact-check and analyze that op-ed. There is of course no executive order yet. IHE also notes “this is not the first time President Trump has used an incident at Berkeley to suggest that federal research dollars should be cut off over alleged denial of free speech rights. In 2017, violent protesters (believed by university officials to be from off campus) set fires and damaged property at the university just before a scheduled appearance by Milo Yiannopoulos.” Trump then tweeted “no federal funds?” in the context of Berkeley. The responses from free speech and campus groups to the proposed order were cautious but stressed non-partisan principles in holding up the First Amendment. Those statements directly oppose openly partisan statements by Kirk in his op-ed. To be clear, Kirk isn’t making this “cover” reference to the First Amendment, federal policies, or any already-on-the-books statement. He is suggesting Trump’s unwritten executive order would be analogous to how ground troops are supported by bombing campaigns and helicopter gunships. Kirk sees Trump as a commanding general who can “clear the way” for Kirk’s troops. That is partisanship on its face. “Moving in the wrong direction” is hardly the same as Kirk’s “extremely one-sided” and feeds “a biased” knowledge to students. Even if you add the 79% of GOPers and 17% of Democrats who say professors bring their political and social views in the classrooms and so might think that is Kirk’s “most Americans,” that data point is not evidence for Kirk’s claim. Some classes call for the professor’s “political and social opinion” as those classes are about political and social opinions. But more broadly, I have written previously about Kirk’s claims about higher education and what he calls “indoctrination.” See here, here, and here. I also have checked Kirk’s claims about specific campus speech incidents, including the Milo event at Berkeley. See here. Does the California “hate crime” law apply here? No, not with the evidence we have at the moment. There is no evidence in the video of the incident that the Turning Point volunteer was assaulted for anything other than his political views. CNN reported that the attacker called the victim “racist” but that is not an attack on his race. But Kirk is also suggesting that the assault of the Turning Point volunteer is also done by campus groups — professors and administrators in particular. That is a false statement. Hard to prove people aren’t doing a thing, but if anyone has a report of a professor physically assaulting a conservative student or campus visitor based on their politics, let me know. And pulling down fliers and erasing chalk isn’t the kind of “thuggery” Kirk is referring to. It also seems Kirk is categorizing the “thuggery” of the assault with the “thuggery” of what he sees as discrimination against conservatives on campus or suppression of their speech. Yet there are moments in Kirk’s op-ed where he implicitly but inaccurately defines the legal status of free speech. Free speech in America is dedicated to the capability of speakers to speak and their content not be part of the assessment of whether they can speak. In short, they are not judged based on the content of the speech. Someone calling someone else a racist is protected speech. And being threatened with violence is not a speech issue. Kirk does not say but he is likely referring to the private, Jesuit-based Santa Clara University “student leaders” who rejected Turning Point’s “bid [in 2017] for official recognition,” according to the San Jose Mercury News. Here it was the duly elected student government that denied Turning Point status on campus. This example had nothing to do with the First Amendment. It was not abridged here. Turning Point was also not given student organization status at the private Iowa campus of Drake University, according to the Des Moines Register. Same misapplication here by Kirk: it wasn’t banned from speaking, just access to student government facilities and funds. Finally, Kirk conflates changing political ideologies — going from right to left, for example — with free speech. And it is that change that Kirk hopes somehow Trump’s order will lessen. With this sentence, Kirk implicitly seems to want colleges to stop teaching what he sees as anti-American values. Or he says if only conservative or American values were taught, more would be conservative. I and others see this as an attack on the foundation of higher education: academic freedom. Kirk has a misguided view of academic freedom. It is enshrined in principles more than 100 years old, agreed upon by ideologies of all stripes. Kirk cries a lack of “imbalance” in professors’ speaking and that professors use the cover of academic freedom to not promote his point of view. He sees “freely exchanged” as mandating one teach every side or every opinion of every issue. This is a bad view of that exchange and not good teaching, as I show here. Kirk wants to impose speech he wants on those professors. He wants experts who have studied and researched and published and taught and so concluded their professed opinions to be forced to speak his opinions. He believes that these people can’t make up their mind correctly, or that they, too, were miseducated. But he ignores how they simply came to another conclusion than his preferred one. He implies conspiracy whereas the truth is critical thinking. If Kirk’s imposition isn’t an affront to and denial of the First Amendment, I don’t know what is. One person speaking — even a person with power like a professor — doesn’t “silence and eradicate” another person speaking. This is why “shouting down” speakers is against the First Amendment. In the end, Kirk wants to impose not only his rules on others, but his speech. That is the heart of what Trump is doing as well through his proposed order.